tl;dr Raise enough to hit the next milestones to raise the next round plus a healthy buffer. After starting PrimaTable in 2011, raising a seed round and selling to Hotel Tonight and now sitting on the other side of the table, I’ve been asked: How much venture funding to raise? Fund raising can be more art than science with a competitive process that dictates terms. In this post, let’s take a quick look at the data. Thanks to Crunchbase, there is data to examine. Cumulative Distribution of First Round Amount. Follow On by First Funding Amount. 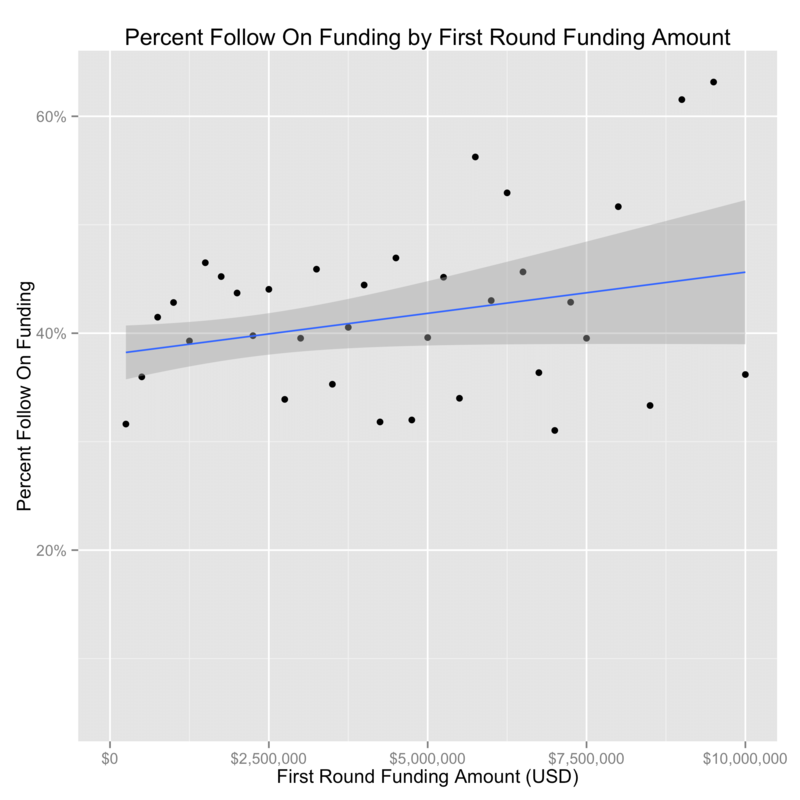 There seems to a positive correlation between the initial fund raise amount and the likelihood of a follow on round. Note, this is clearly an instance of correlation and not necessarily causal. The companies that raise more money may be more likely to succeed or better able to raise a subsequent round of funding. There are likely exogenous factors that influence follow on rounds. However, the relationship makes sense. In order for it to also reflect the collective wisdom on fund raising, the relationship should demonstrate a very specific activity based on individual company dynamics. Decomposing fund raising impact further by category, the positive correlation in general persists but varies dramatically by category. In many categories, Biotech, Cleantech, and Software, there is no explicit relationship. 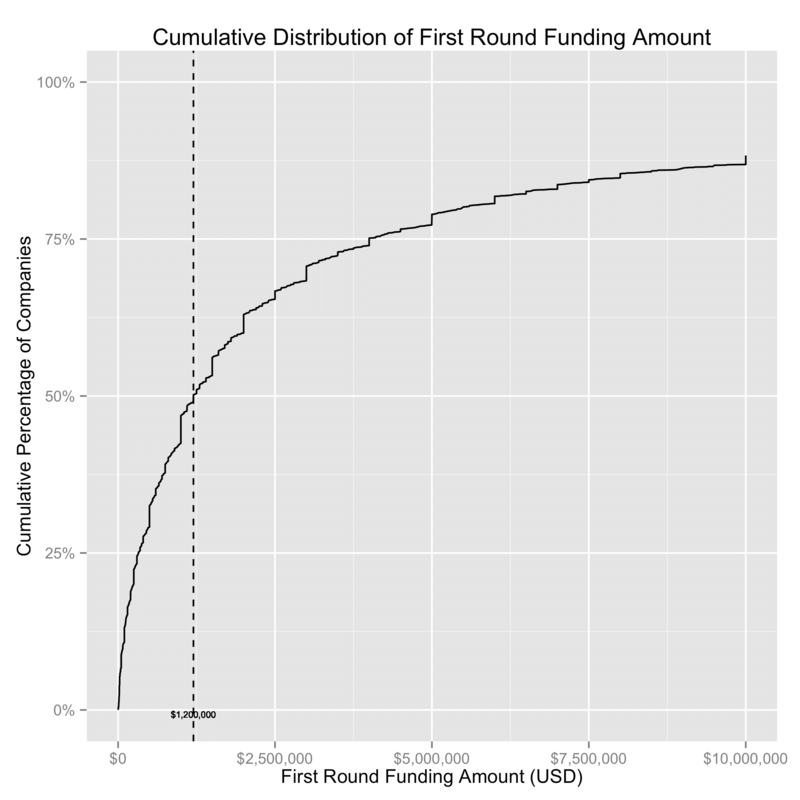 Companies that have raised larger initial rounds haven’t converted to a second round at a greater rate. In the case of Mobile, the relationship is the inverse. 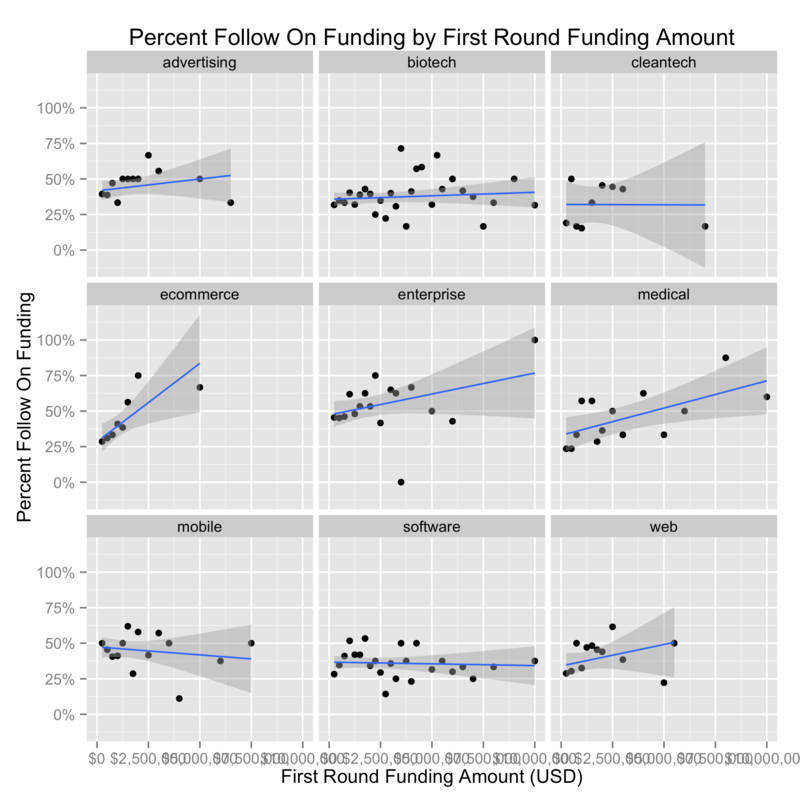 Mobile companies that have raised more are in general less likely to raise a follow on round. In addition to differing relationships with additional funds, the aggregate amounts across category varies. The median amount raised when conditioning on follow on rounds varies wildly. 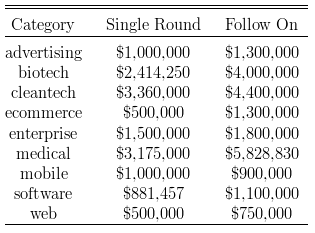 In ecommerce, the median first round for companies that raised a further round is $1.3M vs just $.5M for companies that haven’t. This data can help substantiate the thesis that you should raise enough to hit the next milestones and mitigate risk with a sufficient buffer to weather the inevitable bumps. Valuation for startups only increases on mitigation of risk. For example, in some seed stage companies, this can mean mitigating technical risk and building a working product. For a series A, this might mean finding product market fit and showing user engagement. For later stages, this can be demonstrating a scalable distribution channel and business model. Regardless of the stage, future rounds will necessitate mitigation of risk. Mark argues to mitigate financing market risk by raising at the max of the range that is possible. This make sense to protect against macro changes that change fund raising dynamics as well as gives as much fuel to hold on as long as possible. This can be detrimental because this ups the level of risk that must be mitigated prior to a subsequent round. In practice, for most early stage startups, the increments of funding look to be 12 - 18 months of runway. The round size varies with the team but you can use a rule of thumb of $125K / developer / year ($100K salary + 25% expenses). In summary, raise enough to hit the next milestones plus a healthy buffer.